Jack Canfield, Founder of The Canfield Training Group and NY Times Best-Selling Author of The Success Principles and Chicken Soup for the Soul series is proud to introduce his newest Canfield Certified Trainer in The Success Principles and The Canfield Methodology, Becky Hill. Becky has spent countless hours learning, practicing and teaching the proven methods of The Success Principles so that she can facilitate greater success for individuals and groups around the world. 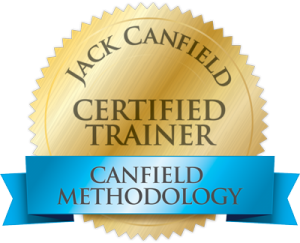 And by becoming a Certified Trainer in The Canfield Methodology, Becky has successfully demonstrated that she has intensely studied the material, applied it to her own life and her teaching, and is now equipped to be teaching this powerfully transformative work to you or your organization. Becky has over 26 years of experience training and coaching sales teams in presentations and communication skills, as well as coaching entrepreneurs in building their businesses from the inside out. Becky also holds Health and Safety trainings for engineers in biohazard management, as well as healthcare workers to improve safety practices. Becky does this through single and multi-day trainings, interactive workshops, as well as through group and one-on-one coaching. Having worked in both the business and the public service sectors, Becky marries her technical knowledge and skills with her passion for people in the Healthcare and Educational arenas. Becky is extremely passionate about creating meaningful and memorable educational programs that connect people with their passions and inspire them to lead from the inside out in both their personal and their professional lives. Need help? .... Want to know more?